/ News / Crowdfunding Valuations in the Netherlands: Are We Crazy? In a series of two guest blogs Thomas Mensink will look at crowdfunding valuations and success of Dutch startups. Friends, family and fools. That’s how we refer to the group of investors that is willing to put money in your startup business when the risks are high. How foolish are they? I analyzed the equity crowdfunding deals in the Netherlands to see whether the valuations people are willing to pay are rationally explainable or emotionally nuts. 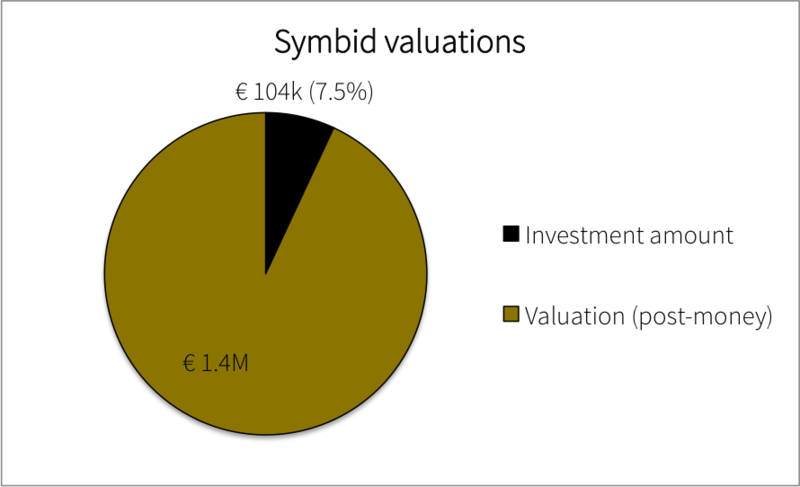 Conclusion: the average project on Symbid (excluding one-off projects) raises EUR104k for a total company value of EUR1.4m, which represents an average equity stake of 7.5%. When we look closed in to the different ‘raising statuses’ of the crowdfunding campaigns, we find that successful projects (N = 38) search for a smaller investment amount than unsuccessful projects (N = 17), but have higher valuations (and thus a lower equity stake of 5.9% and 12.5% respectively). Conclusion: it seems that the valuation is not a critical success factor for raising crowdfunding money; projects that were able to successfully raise the investment amount sought have higher valuations. Maybe crowd investors don’t look at the valuation or don’t care about it. The personal connection to a project might be a better reason to invest than investing to actually make money. In the sequel of this post, I’ll dig deeper into the valuations of two subsamples: pre-revenue companies and companies that generate revenue already. One would expect that the latter has higher valuations than the pre-revenue companies, right? In addition, I will compare the valuations of Symbid projects with other disclosed valuations such as the standard terms of Rockstart and Startupbootcamp. This will lead me to the conclusion: how foolish are the friends, family and fools? Hi Thomas, Interesting article and good that someone is doing some research. I have one question though: you are using postmoney valuation and to me that seems wrong: the postmoney valuation is the value of company+money. It would be better to look at the pre money valuation as this is just the company. Did you consider this? Why or why not? I indeed looked at post-money valuation, as this corresponds to the value of the company after the investment (this is what is shown on Symbid too). The pre-money valuation is post-money minus investment, so the average pre-money valuation on Symbid is €1.4M – €104k = €1.3M. Seem very high valuations to me for a startup. Depends of course how far the startup is in traction and revenue stream. Also I find the equity of 7,5% very low for € 104k. Doesn’t look like a good investment to me. Also as you know how professional angels look at startups. Or am I missing somethingn here. On the other hand crowdfunding can be very interesting for startups, if you know how to start a succesfull campaign. Great article. One of the main reasons for these high pre-money valuations on Symbid is the link between Symbid and Equidam. As an idea / startup is hard to value, many projects on Symbid use Equidam as a business valuation tool. We did as well to benchmark our own valuation. Our idea came out with a 2.2 million euro pre-money valuation. It looks trustworthy but we think the model used is flawed The business valuation was way above our own defensive valuation of 300.000 euro. As we want to engage serious investors as well we decided not to use the Equidam valuation. Our idea is still on ‘closed stage’ on Symbid, and you will see a low valuation and a high % of shares compared to the other ideas. Fools? It draws attention to say the least. But I think the expression Fans – next to Family and Friends – would do / have done much more justice to this group of investors. Friends, Family & Fools is simply the expression, not a term minted by Thomas. Fair enough :)! It would actually be nice if the terms would start to morph towards “fans”, because these early investors can actually be pretty important to the startups involved, so might deserve a more positive nomer. I think this analysis is just scratching the surface of an interesting topic, but the way the results are reported seems incomplete and biased. The beauty of equity crowdfunding is that creates a pool of market demand for startups’ equity, thus tapping the offline angel market. In equity crowdfunding, the entrepreneur sets the price and then tests the appeal with a large pool of individuals, which can take it or leave it. In an offline market, with few angels, with strong bargaining leverages, the “take it or leave it” decision is often left to the entrepreneur. Also, crowdfunders are investing much less capital individually compared to angels and, as a consequence, are not providing the entrepreneur with the expertise an experienced angel brings to the management of the company. This alone is a good reason why valuations may be higher than what angels would pay. A way to prove this would be analysing the key characteristics of the companies, by ranking them according to stage of development for instance, the experience and quality of founders, revenues to-date, or any other feature which indicates a higher probability for the company to succeed. But this is something omitted from this argument. As most of the valuations on Symbid were estimated on Equidam (of which I’m co-founder), high estimates are not a result of Equidam or Symbid influence (neither of us checks the entrepreneurs’ inputs in the valuation system) but rather of entrepreneurs’ own inputs. If crowdfunders believe in entrepreneurs’ expectations, then they are willing to pay that price and, again, that does not necessarily make them fools. “The correlation between success and higher valuation does NOT indicate that crowdfunders were fools, rather than the company case was simply better”. Nowhere in the article do I see the author conclude that crowdfunders are fools, something you are saying the author concludes. His conclusion is literally that from the data available “valuation is not a critical success factor for raising crowdfunding money.” That’s all. Malicious? That’s quite an accusation… What would Thomas’ incentive be for writing a malicious article? A completely ridiculous comment. As for the title – friends, family and fools is an overal term for these type of rounds, nothing invented by Thomas. Maybe you should Google it, so you should see it is the normal use. Especially before your unwarranted reaction. How do you call publishing an incomplete research, based on superficial data and flawed by personal opinion (bias)? I keep on thinking this is not a god research. Hello Thomas, I am sorry, but I find this a terribly researched article. Sure the graph is interesting, but there are no conclusions at all to be made. I agree fully with Mr Valentini’s second to last paragraph. Without correlating success with any other company characteristics other than their proposed valuation and sum raised there is little use discussing it (and for startupjuncture to publish it). As an ‘investor readiness’ expert, you should know this. For example, it seems completely logical to me that the more interesting companies (either through track record, proposition, or both) will get away with higher valuations AND be more successful in secured funds. Something you completely ignore and makes your case for implying that crowdfunders care little about valuations shaky to say the least. Ron, whether you find it interesting enough is obviously up to you :), yet your comment seems to be counter to your own behaviour (no point discussing/publishing it – yet you contribute to the discussion – which I applaud). The success of crowdfunded startups is something that is still up in the air. We’ve started to see the first failures (bankruptcies), but it’s still early days, so the analysis will get increasingly interesting in years to come. Trying to add a success factor into the analysis now would be far too early and not grant the startups enough time to show their level of success. Thanks for the response Wouter, and kudos for attempting to defend your guest writer, but I’m afraid you are twisting my words. What I tried to say was that the discussion whether or not crowdfunders are sophisticated and care about valuations cannot be based on the data presented. Discussing the value of the article and methodology of its underlying research is a different matter entirely. I find it dangerous to publish unfounded conclusions or even thoughts, especially when the potential faults are not noted. So I am very happy to enter that discussion. Likewise, I am not talking about the success of a venture, but the success of a fundraiser. That was also the level of success discussed in the article I believe. So how about you or Thomas try to explain why you can suggest that the investors do not care about valuations, and why the company characteristics are not part of that analysis. Well the success of fundraising vs. valuation is the one point that is actually considered in the analysis right? Although I would definitely agree with you that the low number of observations implies we’re in statistically (probably) insignificant area the conclusion seems pretty sound that higher valuations don’t have a negative effect on the success of raising funds via Symbid. There could be a multitude of reasons for the absence of this relation. Some of those (semi-)rational: better marketing, better case, better relationships, better numbers, etc. others could be more emotional family, friends, fans (like Ronny suggests :)). The author mentions he thinks it could be funders don’t care. I wanted to wait with my reply after publishing the second part of this analysis, but I see that people misread and misinterpret my data and conclusions, so hence my reply (although Wouter clarified some things already – thanks). @Gianluca I think you raise a valid point that angels and VCs bring ‘smart money’ to the table, in contrary to the crowd (usually, but not necessarily), which could affect the valuation. I know the title and the term ‘fools’ (as in: friends, family and fools) might lead you (and anonymous Ron Z) to the conclusion that I find crowd investors fools. This is not what I actually wrote. Folks: I presented some facts. The numbers are not made up by me, you can actually look them up. I didn’t study company characteristics (at least not in this post), I didn’t study correlations, I didn’t study causations, I just analyzed the numbers. And that’s exactly the reason why I am cautious with my conclusions. READ my conclusions. As Wouter said before, one of my conclusions is “valuation is not a critical success factor for raising crowdfunding money.” Why not? Because the projects with higher valuation did get funded. Maybe the propositions were better, maybe the teams were stronger, maybe the story was more compelling…I don’t know and you don’t know. The only thing we know and can conclude is that apparently a high(er) valuation is not a knock out criterion for crowd investors. As an ‘investor readiness’ expert, I know this. I like the discussion content wise, but I truly don’t see why people find this post “malicious”, “biased” or “terribly researched”. I don’t have a second agenda, I was just curious about this hot topic of crowdfunding and I was crazy enough to manually sort this out. I hope, based on my points above, and my second post, which is just published on StartupJuncture as well, that you see the broader perspective, because I also believe in crowdfunding as additional instrument in the funding landscape. I am curious what you think of it. Thanks Wouter and Thomas, for explaining further. Unfortunately I still get misquoted (I haven’t even touched the sample size issue, and have not accused Thomas of thinking anyone is a fool), but I’ll get over that. -> Quite right re: the numbers, but you can conclude very little from them. The first conclusion you make [“the average project on Symbid (excluding one-off projects) raises EUR104k for a total company value of EUR1.4m, which represents an average equity stake of 7.5%.”] is fine if the sample would have been sufficiently large. The second conclusion [“Conclusion: it seems that the valuation is not a critical success factor for raising crowdfunding money”] is not a ‘fact’ at all, regardless of the sample. Unless you take a look at each individual proposition you cannot make any comment about the relevance of the valuation. Would you suggest that if they used a lower valuation crowdfunders would have less appetite? You would probably not. The rest of that particular paragraph actually only makes things worse. -> first you introduce the questionable sample size, and then you say this. But as stated above, regardless of the sample, this conclusion cannot be made at all. -> I would prefer something in the line of: there could be a multitude of reasons for the valuations to be higher, and the fundraiser to be a success nonetheless. -> Now this is suddenly rather vague, ie, what is a “knock out criterion”… Also, this sentence would apply to all types of investor, so I am fine with this. But this is not mentioned in the article. Now, in your comments, both of you do list numerous reasons why ‘there is no relation’ (WK) and ‘why projects with higher valuation get funded’ (TM). Thomas is using the right question here (albeit for the wrong reason, namely to explain the second (faulty) conclusion). But the article needed this listing, not the comments. That was my whole point from the outset. I deliberately chose to answer you first before reading the second part, as the conclusions drawn in this first bit did not take the second into account either. Now, the proposed goal for this ‘analysis’ was to “see whether the valuations people are willing to pay are rationally explainable or emotionally nuts”. I hope the second part does a better job at it. I’m afraid you don’t get it, Ron Z. Here is one last try to explain my second conclusion (valuation is not a critical success factor for raising crowdfunding money). Maybe this is what causes the confusion: the word “success”. I don’t talk about company or product success here, I talk about ‘successful’ as successfully closing the deal on Symbid; raising the investment amount that the company sought. This is data: projects with higher valuations did get funded. People also fund more ‘expensive’ projects. The ‘price’ of a project is hence not a critical success factor to not invest. This is my personal interpretation: maybe that’s because people don’t know or don’t care about it. I don’t have data why they invest, so this is just my feeling based on own experiences and the people that I talk with. You are free to believe whatever you like Thomas. All fine. But to share these beliefs in this way is dangerous as I said. The analysis is flimsy, the conclusions unfounded. I understand your reasoning perfectly. Nothing in my responses should give you any other idea. You CANNOT say anything about whether or not the valuation is a critical success factor given this data set. You COULD say for instance: crowdfunders do not limit their investments at a certain valuation. But you cannot imply that they do not take valuation into account unless you analyze the propositions, or better yet, interview the investors. simply, he cannot draw any conclusion, because there is no research methodology! I hardly believe anybody would be so naive to publish this kind of article if the intent was not the love for discussion and analysis but rather a personal purposes. As said, this looks and feels malicious to me and the second article confirms that. Wanna share your personal opinion?! Fine, don’t disguise it as a research article: those do not include opinion but factual observations. I’m getting a bit tired of your accusations that I have a hidden agenda or so (it’s ironic that YOU are saying this). I don’t. It’s fine if you don’t like the article, but it would be more constructive if you could actually contribute something. It’s always easy to just shoot on something, but it’s a different thing to actually come up with solutions, improvements and insights. Your company, Equidam, offers the tools that entrepreneurs on Symbid use to determine a valuation so 1) YOU have a personal interest 2) you probably have interesting data and insights that could contribute to the discussion but for some reason you chose not to do so. My research methodology is actually quite simple: 1) find data on Symbid 2) present data. I haven’t added anything; in this (first) post I only divided the sample in the projects that successfully raised the money and the ones that didn’t succeed in that. This is factual data. In the second post, I divided the projects in pre-revenue and revenue, and in most cases (not all, I sometimes had to make an educated estimate) this is also factual data (spreadsheets, disclosed in the text etc.). The comparisons with other valuations are based on factual data, but Wouter and Ron Z suggested improvements to make better comparisons and to formulate more precise interpretations. But you… you don’t seem to contribute anything. I don’t know what bothers you so much. If you don’t like the methodology (for example: because you have other/ more data) then add your suggestions or own analysis. If you don’t like my interpretations then add your interpretations. If you don’t like my conclusions then show us why you don’t agree. If you don’t like the factual data then I’m sorry but I can’t change the data. I’m actually quite interested in your opinion on the valuations of crowdfunding projects. Please let us know. Crowdfunding is the best way even if you loose your money because it is a small amount. Look what SEC lost for the investor 50 billion dollars. People lost their life savings.